You are constantly confronted with deciding between doing something yourself or having someone else do it for you. Should I cook or go out to eat (order-in)? Should I clean my house or hire someone to come in and do it? Should I change the oil in my car or take it to a mechanic? With so many products and services available to cater to your every conceivable want, it hardly seems a difficult choice to make. But, I believe, you end up making a Faustian bargain in making the easy choice. I have also found a similar sense of joy, satisfaction and pride managing my own place. (It’s more than just cleaning.) I learned about 5S when I got started in the Quality field: Sort, Straighten, Shine, Standardize and Sustain. It has greatly helped me organize my life. Repeating the first four steps each week as part of the fifth step has kept me in touch with what is happening in my house. I have been successfully getting rid of things I don’t need or use instead of wasting time and energy caring for them. Putting things in their place has meant being able to find them when I need them without frenzy and panic. Cleaning everything on my own has let me see problems & fix them promptly before disaster struck. Doing things by yourself helps you grow. You’re not always going to get things right the first time around. Nor is it going to be cheap. But, it adds to your experiences that make for a great life story that you can share with friends and family. It’s your life. You should live it, not outsource it. This rarely happens. So rarely that I don’t remember the last time, if ever, I had a clean drive to my destination. You know, the drive where you not only hit every single green light, but cars shift out of your lane so you don’t have to compensate for their slowness. Ah! It was most satisfying. But, is it really so? Are there alway special causes? Would it all be okay if ‘this guy’ or ‘that girl’ would just drive better — like me? I decided to check. 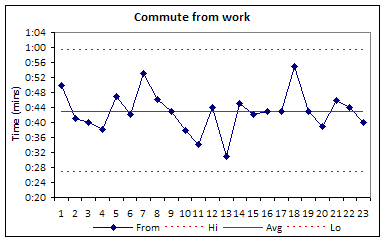 Everyday I’ve been logging my commute time to and from work. They are shown in the charts below. Sure, the average (solid red line) commute to work (~35 minutes) is less than the average commute from work (~43 minutes). And, yes, the variation about the average commute to work is a lot less than that about the average commute from work. But, all points are within my control limits (dashed red lines)! That means, all the variation about the average is from common causes! There are no special causes. If there were special causes, as would have been highlighted by points outside the limits, I could do something about them. If I ran out of gas during my trip which then added to my commute, I could start my future trips with a full tank of gas. If my tires ran flat because they were bald and delayed me, then before all future trips I would make sure my tires were okay. If there was an accident, then I have a legitimate excuse for being late. Thing is I have no control over common causes for variation like traffic signals changing to red or getting stuck behind some random slow driver or rain or fog. Sometimes, all these things and others combine in a ‘perfect storm’ to make the commute unusually long… or unusually fast. 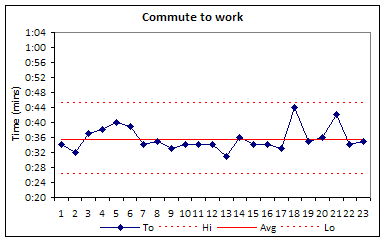 What the charts tell me is, by and large, the time it takes me to get to work will be between 26 – 45 minutes, and the time it takes me to get home from work will be between 27 – 59 minutes. No amount of frustration is going to change that. Instead, I should tune into NPR and learn about what is going on in the World around me. Austin, TX — We are at the start of another year, and if you are like most people, you have made a few resolutions; set some goals for yourself. Chances are that some of those resolutions are the same as ones from last year or the year before last or the years before that. So, if the past is any sort of predictor of the future, there is a high likelihood that this time next year you will be here once more repeating this annual ritual with many of the same resolutions; living life like Phil Connors in ‘Groundhog Day‘. But, it doesn’t have to be that way. You can break out of this never ending cycle and achieve what you have been setting out for yourself at the start of each new year by defining SMART goals. Goals that are specific, measurable, achievable, realistic and timely. Perennial favorite resolutions like ‘lose weight’, ‘get in shape’, or ‘be healthier’ are meaningless because they don’t provide a path for getting from here to there. And, there is no way of knowing if you got to where you wanted to get to. But, a goal like ‘I will run one mile on the city trail on at least 75 of the next 90 days to get in shape’ is SMART. It is specific. It answers the 5Ws: Who, What, When, Where, and Why. It is measurable. You can determine how far you have run and count how many days you have run. You can then compare your performance against your goal. It is attainable since you will give it a high priority and realistic as you have decided that you are capable of running one mile. 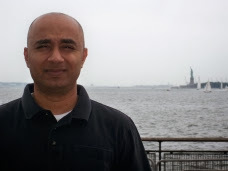 Finally the goal is timely or time-limited: it must be complete in the next 90 days. However, defining a SMART goal gives you just a map for getting to your goal from here. Ultimately, you need to do what you stated in your goal. You need to run that mile on the city trail at least 75 of the next 90 days. Oh, and you need to log your results and track your progress. That last bit acts as your compass, providing you feedback as to whether you are on course to achieving your goal or off it. Just like water and wind currents will move a ship off of its course, invisible forces like weather, illness and injury, or unexpected emergencies will assuredly pull you off of yours. Your progress chart will help you make the necessary course corrections and reorient yourself towards your goal. When your alloted time is up, you need to compare your performance against your goal. Did you do better than what you set out to do or did you fall short of the target? Regardless of the answer you should follow up your SMART goal with some reflection. Ask why did you perform the way you did? Was the goal not challenging enough? If so, you need to boost your expectations for the next go around. Was the goal too ambitious? Did you fall short of it because of weather conditions? Perhaps you need to find an indoor track. Was it because you injured yourself? Perhaps you need better shoes. The more times you ask Why, the better you understand the nature of your performance. This helps you define the root causes that directly led to the short fall in achieving your goal and mitigate them going forward. With fixes in place, you can reasonably expect to meet or exceed your goal during your next effort. After all is said and done, one thing matters more than all the others: following up your good intentions with concrete action. The simple truth is actions speak louder than words. To get from here to there you need more than a goal, SMART or not. (Although, a SMART goal will boost your chances of achieving it.) You need to move towards it. So, get moving and make good on your resolution this year!